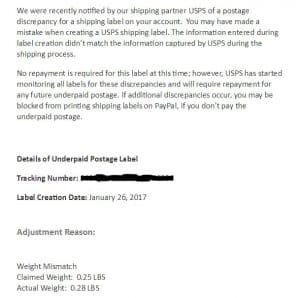 Across the Buy, Sell, Trade boards, members are reporting an Underpaid Postage Courtesy Note detailing that they have not paid enough postage on a package they have shipped. The email appears as shown here. It references the tracking number and gives you a difference in weight that appears to be negligible. It appears that at this time, Paypal is not requesting additional payment for the package. So what is going on? And why are the weight differences so small? It seems that USPS is cracking down on online shipping leakage. It seems that the weights that appear are not the actual weights submitted or measured, but that they are using the breaks between ounces to identify the discrepancies. So to the right, what they are saying is the seller entered 4 oz for the package, but the package should have been entered as 5 oz. It is strange that they are using pounds as the unit of measure because it makes it look like the difference is negligible, but in actuality, there are different rates for 4 vs 5 ounces. I’m sure in the past you have received a heavy package that says 6 oz or even a package of clothing shipped Media Mail (which is only for shipment of books and media). Often these packages went through without a hitch, which of course results in less revenue for USPS. As online shipping has grown, so has the revenue leakage from improperly posted packages. It is not clear when the package is being weighed in the shipping process, but there is now a definite communication loop between Paypal and USPS. And while the current notifications are not asking for additional funds, it is clear that in the future, sellers will be expected to pay the additional funds or be blocked from shipping in Paypal. So what can you do? The first step is to be sure that you have an accurate scale. The scale shown here generally runs between $16 & $20. You can pick one up here! Using a scale every time will certainly reduce errors made by guesstimating. In addition, make sure you are weighing correctly AND accounting for the FINAL weight (including any label you will be adding). It is very important to note that USPS postage rates for packages are “up to”. This means that if you select 10oz as your package weight, your entire package once labeled must weigh less than 9.99 oz. (This is where many errors are made, USPS weights NEVER round down). The second step is to be aware of your packaging, particularly for Priority Mail shipments. The post office (and USPS.com) has two types of packaging, flat rate and regular rate. If your packaging does not indicate that it is flat rate, you are responsible for the distance-based priority rate (which can vary greatly). In addition, when using a padded flat rate envelope, you must select “padded” in Paypal. The rate is slightly higher than a plain cardboard flat rate envelope. Finally, be sure that when you are shipping from somewhere other than your home zip, that the shipping zip code is updated. Oftentimes when an error in shipping is made, sellers will send a buyer a label to forward a package onward. While for first class it does not make a difference, distance traveled does matter for anything going priority (that is not in flat rate envelope). By following the above guidelines, you are far less likely to be on the receiving end of an Underpaid Postage Courtesy Note. Since this is all so new, we will have to see how it evolves in the future. Previous Post REI Winter Clearance! Up to 50% off Sorel and more! Next Post EXPIRED: Exclusive! 25% off Pura Vida Bracelets + Win a $50 Credit!